Accuracy over distance with a rifle is hard! Thousands of people compete every year to prove that. Attaining that accuracy is of paramount importance to hunters, recreational shooters, police, and military personnel. The proven method is a consistent, quality rifle scope. Rifle scopes are a complicated topic. Though the basic technology has remained much the same for the past 50 years, the materials and options have become more complicated. This is only compounded by the growth of the optics industry and the sheer number of brands available. To make sense of it all is a huge endeavor but together we will navigate that minefield. If you want the best rifle scope with the best performance, there will be a ton of information to cover but we got you! No matter what your question, we should have the answer you need in an easy to follow format. Rifle Scope 101 - How to Choose? If you are new to optics, this is the place to start to get a handle on the terms you will need to know. If you're looking for a scope on the market & are searching for what is best for your purpose, start here. Everyone has a set budget they have to live with. To find the best scope in your price range, head here. Some guns perform better with some optics. To see what matches best with your firearm, check out this section. From fan favorites to the classics, we nail down the most popular brands and give some great examples of their products. If you want to get a handle on the high-end best night vision, thermal, and spotting scopes, check this section. There are a few mistakes that are common but easily avoided. Don’t make these errors. If you need help getting your scope up and running, this detailed section has the answers. Part 1 - Rifle Scope 101 - How to Choose a Rifle Scope? Scope science isn’t rocket science but it is quite complicated with a plethora of terms, acronyms, and even a little math! If you have been buying scopes for years, you are likely pretty in tune with what everything means. However, if you are new to rifle scopes it can be more than a little daunting. Don’t be intimidated by all the technical jargon that trips up most people. While knowing that jargon is important, knowing what it means in layman’s terms is far more important. That is the first step and goal of this section. After this section, you should be up to speed with what everything means. Not just in a technical standpoint but to you, the shooter. When we purchase a scope, magnification is the primary factor we are interested in. It is important but not the only factor we should consider. Instead, it is more of a starting point. Keep that in mind as you read through. The easiest way to think of magnification is not that it makes targets appear larger but that it makes them appear closer. This is directly opposed to what we learn in school on microscopes but the distinction with a rifle scope is important. The size of the target is the same. Keeping that in mind focuses us on hitting exactly where we intend to. All scopes will have a designation such as 9x40 or 3-9x40. In these examples, the number before the ‘x’ is the magnification. The first example is a fixed magnification while the one after is a variable magnification. Fixed magnification means that the scope always makes things appear 9 times closer in our example. The variable means you can adjust the scope to make the object appear anywhere between 3 and 9 times closer. Fixed power scopes are more durable. They have fewer moving parts that can fail. This has made them a primary choice for the military. Conversely, you are stuck at one power rating which makes the scope far less versatile. Variable power scopes do have more moving parts but are far more versatile. They can be used at a huge variety of ranges. Some variable power scopes can stretch from 4x to 20x meaning they work at very close ranges all the way out to 1000 plus yards. There are optics that have no magnification. This would be a 1x optic. Usually these are red dots or reflex sights but can be a traditional scope. You will see a few 1-4x scopes out there. These cater more to those who want something for home defense or a little more speed and accuracy at moderate ranges. In our examples above, after the ‘x’ is the number 40. This represents the size of the objective lens in millimeters. The objective is the lens opposite where you place your eye. It has no magnifying properties on its own. It has only one job. As you increase in magnification, it takes more light to keep your view clear and bright. This means your objective will have to increase in size as you magnification increases. Simple enough, but there are issues with an objective lens that is too larger. The primary problem is fitting the scope to your rifle. The limiting factor for how big an objective lens can be is how high far above the rifle you can mount it without causing problems. In general, you want the scope mounted as close to the bore axis as possible. A smaller objective lens allows it to be mounted closer. Understanding the physics behind mounting your scope higher and lower is far beyond basic scope knowledge and very complicated. For now, just stick with standard height rings and a scope that can be mounted in them. Coated: The objective lens has a single chemical coating, often that reduces glare. Fully Coated: Each lens has a single coating. Often they will be different on each lens. Multi-Coated: The objective lens has a variety of coatings that improve various aspects of visibility or serve other purposes. Fully Multi-Coated: Each lens has a variety of coatings that will improve the scope performance or functionality. Coatings can reduce glare, add scratch resistance, and even prevent fogging. Often companies will detail any of these separately from their lens coatings. Take special note of these. Probably one of the most confusing aspects of scope selection is the vast array of reticles you can get. The reticle is simply the crosshair or other symbol inside the scope that is used for aiming. Getting the correct reticle can go a long way toward getting a scope best suited for your needs. People assume that scopes are intended for shooting long ranges but that is not always the case. There are reticles that are designed for long range accuracy but there are dozens that excel at medium and even short range. The standard reticle is the crosshair made famous by many movies and cartoons. This is the simple cross in the scope of very thin lines. It does work well for those who want something simple and easy to use. An upgrade to this is the duplex reticle. This is much like the crosshair but with some thicker lines at the edges of the scope that step down to thinner lines as you near the center. This makes the reticle easier to see in dim light. Both of these options are great for hunters and casual shooters. Some reticles may be a shape such as a circle, dot, or chevron. These are often intended for shooting shorter distances. The scopes that have them are often lower powered. They make a good choice for some hunters and many home defense applications. The long distance scope will usually have some form of reticle designed to help determine range or bullet drop. They come in two standard styles, Mil and MOA. Though they are different, for the layperson how they are different is unimportant. For those looking for great accuracy at range, be that 300 yards or 1000 yards, this is the type of reticle you want. Most scopes designed for the distance shooter will have one of these two options. Both are equally good, it is more a matter of what you learned on or simply personal preference. In addition to a standard MOA or Mil configuration, most companies have developed their own style of these reticles. This makes things seem more confusing but realistically, there is no difference in how they work. As long as you know you are getting a Mil or MOA reticle, the details aren’t that important. In addition to patterns, some optics will have colored reticles or illuminated reticles. The colored option is exclusive to closer range scopes and usually only on shape reticles. Illumination is more common there as well but can be found on some high power optics. Scopes all have some form of adjustment for both wind (left/right) and elevation (up/down). There are a few considerations when it comes to elevation that you want to keep in mind. Simpler scopes will often have what is called capped adjustments. With these scopes, the adjustment screws are covered with caps to protect them and prevent them from changing. These are very popular with closer ranges and hunting scopes. Other scopes have turret adjustments. With turrets, you can adjust windage and elevation at any time during your shooting process to compensate for that particular shot. This is reminiscent of sniper scopes and long distance scopes. All turrets adjust in either MOA or Mils. The best bet is to use the same form of adjustment as you do reticles. If you shoot an MOA reticle, you need MOA adjustments. This is not mandatory but most new shooters will have a much easier time learning this way. The eye relief of a scope is simply how far from the scope your eye needs to be to get a proper alignment. Without this alignment, you cannot be accurate so this is critical! While most scopes will work for most people on most rifles, there are a few special considerations that may require a little more eye relief. The end result is your choice, just remember that improper eye relief can cause accuracy issues and eye-strain. If you wear glasses, often you will want a little more eye relief. Depending on your glasses, your effective eye relief can be anywhere from half an inch to an inch closer. You may also want longer eye relief if you are shooting a firearm with significant recoil. These rifles can kick hard enough to drive the scope into your eye socket. If you have never had this happen, I promise it is a mistake you will never make again. A final issue dictating a longer eye relief may be your weapon. Some rifles and many shotguns have a mounting point for an optic so far forward that a standard scope will not work. Eye relief can be anywhere from 2 inches to better than 10 inches. You don’t want to go with too long an eye relief as it can affect accuracy and ease of use. You don’t want to go with too little either. Unless your rifle is made in a way that requires a very long eye relief, something between 3 and 5 inches is the most you should need. For more in-depth guide on choosing a rifle scope, you can read this resource. There are a variety of reasons you may want a scope and a variety of rifle platforms that a scope can be used on. While your purpose could be any of the following or a combination of them, these examples will give you the most common selection made by those whose needs are similar to your own. This is easily the hardest scope to pick because there is so much to consider. You will want to use it at various ranges and it will serve a variety of roles. It won’t be specialized so that makes selection somewhat easier. For this purpose, something with variable power from relatively low for close work but with enough high-end power to make longer shots. It should be somewhat robust but not built like a tank. Reticles could be anything you prefer. Capped adjustments are probably the best overall bet. The Monarch is a classic scope that has performed well in a variety of roles. It has a low-end power of 4x and a high of 16x so it fits a variety of uses. It has a BDC reticle simplified turrets which are versatile but easy to use. The lens quality is exceptional and the scope is quite tough making for a solid choice for any need. A tactical scope will be the most high-end option. It needs to have sufficient power and speed. It needs to come from a trusted brand with quality craftsmanship. It needs to be durable. And finally, it has to have impeccable accuracy. You don’t want to go too high on power because that will slow you down. It should have capped adjustments and a reticle with bullet drop compensation. The company should have great quality control and build only the most robust optics. It should be water, fog, and dustproof. The Steiner is an amazing scope that has everything a tactical scope needs. The reticle is partially illuminated which speeds up target acquisition and improves low light performance. It has sufficient high-end magnification for shots out to 800 yards or more with a low-end magnification that keeps the scope fast. It is incredibly durable with great glass. There are few scopes better! A hunting scope needs to be quick above all else. When you are hunting, you often don’t have time to dial in a shot. It should be accurate, high quality, and reasonably robust. A hunting scope should be good but doesn’t have to cost a fortune. Typically something around 10x is great for most people. It should be water and fog proof while being able to stand up to heavier hunting rifle loads. The adjustments should be capped and the reticle either a standard crosshair or duplex style. The Leupold VX series are some of the best hunting scopes on the market. Generally, something with less power is good but the VX-5 with its max 15x is such a good scope. Opt for the illuminated firedot reticle which will be faster and more accurate in dim conditions. Leupolds are tough and have the best warranty around. There is no doubt this is a great scope for the hunter. Though a hunting scope needs to be fast, scopes for action shooting need to be even faster. This is a perfect place for lower power scopes. They will not have to be as durable as scopes which see hard field use but it should be reasonable quality. Something 7x or less is good on the high end. If you can get one that is 1x on the low end, that is great! Capped turrets are fine for these scopes as you don’t have time to fiddle with adjustments. Reticles can be either duplex or a shaped reticle as they are faster. When it comes to speed and quality, it’s hard to beat the Strike Eagle by Vortex. The reticle option is a simplified BDC but with the illumination it is quite fast. The lower power of the scope adds to the speed. It is built tough enough to stand up to any condition and can take quick, repeated recoil from the fast passed competition environment. Being a Vortex means two things, great glass and a great warranty. This 1-6x scope won’t let you down. A true long range scope, something that can hit at 1000 yards plus, needs power above all else. The ability to dial in a shot perfectly is very important as is consistency of your shot placement. It will need turret adjustments and a BDC reticle of some form. It will not need to be as durable as other optics because it will often be shot from a bench and never used hard. Depending on the range you want to shoot, something in the 20x range is great. You do want it to be waterproof but it doesn’t need to be built like a rock to survive. Choose a reticle and adjustments that match in either MOA or, depending on which you prefer. Built like a tank but with the finest glass and utmost precision, Nightforce is one of the best choices when it comes to long-range shooting. The ATACR has everything you need to be successful from a high power to an illuminated BDC reticle. For shots out to 1000 yards or more, this is the scope to beat. There are some that may do it as well but none that do it better. A home defense scope will have to be quick with good visibility. It doesn’t need frills, it just needs to be accurate and work well. It should have a quicker reticle and lower power. Something less than 7x and as low as 4x on the max side. On the low end, 1x is great so you can use it at very close ranges. For a reticle, one of the shaped ones is best but a duplex reticle will work. Illumination is great as well. Adjustments should be caped so that point of aim is never thrown off. The perfect scope for home defense should be low powered with a reticle built for speed. It needs great optical quality, especially in low-light conditions. Being somewhat durable is a plus. It should be easy to shoot and reliable beyond reason. The Trijicon RS series does just that. For the reticle the illuminated duplex with red dot is the preferable option. Scopes for .22 and other small calibers can go one of two ways. You can get something with lower power that works well with the shorter ranges of low caliber rounds. Capped adjustments and any reticle will work fine. It won’t have to be as tough as other scopes because of the lower recoil of the .22. Alternatively, you can go with something with a huge amount of power to get hits on the smallest possible targets. If this is the case, a scope with a good BDC and turret adjustments is great. For small scopes, something less than 10x is good. For larger, go as high as you feel you can afford. Though there are tons of more expensive scopes, this is still one of the best. The quality is good and the scope is quite rugged. What makes a difference is the huge variation in powers making it great for close work of long shots on small targets. The reticle is set up for rimfire cartridges and it has a huge 80moa of adjustment to compensate for bullet drop. This is a great .22 scope, especially for those just getting into the sport. You can get a scope for under $100.00 or you can spend as much as $3000.00. On the lower end, they get better quicker but the true gems are those with big price tags. Not only does more money get better components but the scopes tend to be more durable with better warranties. The best bet is to spend as much as you are able for your purpose. That said, you can get a perfectly adequate scope at most any budget. If you are interested in long range and ultra-long-range shooting this is the scope to have. It is optically perfect, tough beyond reason, and about the best quality all around that you can possibly find. You will pay for the quality but every penny will be worth it. This scope will be the envy of every other shooter you meet and outperform every other optic around. They aren’t lying when they call this scope The Beast. It is an absolutely astounding optic with perfect clarity and a top of the line multi-coat that greatly improves contrast and brightness. It is insanely powerful and so rugged you would have to try to break it. Nightforce is an awesome company with awesome products and this is the pinnacle of what they can do. Leupold used to make a lot of mil-spec optics but they have cut back. The M5 is one of the few still in common production and it is a perfect example of Leupold’s potential. It is optically amazing and very durable. It is backed by a lifetime guarantee to boot. The power is perfect for long range shooting and it has every tool, including an illuminated reticle, to help you with those very long shots. This scope actually comes in so many power options and reticle styles that it can suit any need. We picked one of the most powerful options with an MOA reticle because it is the most fun to shoot. All of them have perfect low dispersion lenses, top of the line multi-coat, and are rugged beyond reason. Vortex makes a great scope and the Razor is the best of the best. It’s strange to see Burris with such a high-end scope when they often specialize in more budget options. However, they knocked this one out of the park. It is optically amazing, far better than any other scope they have ever produced. It has a ton of power at 40x making it perfect for bench rest and sandbag shoots. All around, this is simply an outstanding scope. To get the standard stuff out of the way, there is no better glass anywhere and the scope has great power. It is quite durable if not as rock solid as some other options. Where this scope excels is accuracy. It may be splitting hairs but this is likely the most accurate scope on the market. With so many options, Vortex has something for almost everyone. While it may not be quite as good as their Razor line but you aren’t likely to notice the difference. It comes in several power options with several reticles. We like the mid-range power option of 16x combined with a Mil reticle for the best all-around option. This is Nikon’s newest offering and it has been a resounding success. The Black is an amazing scope that captures the best glass Nikon produces and combines it with all of the features you need in a high-end, high-accuracy scope. For a Nikon, it is exceptionally durable and very accurate. You can get it with different power and reticle options. More of a hunting scope than a tactical scope, the Sierra is an attempt at a Bluetooth smart scope. It can take data from a rangefinder and your ballistic information and estimate a holdover which is shown in the scope. It has a regular reticle as well but the addition of smart technology improves on it to a great degree. What would you expect from a telescope company than an optic with a ton of power? Maxing out at 34x this is one of the most powerful optics you can get in this price range. It is optically quite good with a good multi-coat. It has an etched reticle on the first focal plane. All around, this is quite a good scope. The Engage is one of the best scopes Bushnell has ever made. It is powerful, optically pure, and of the best quality you can get in this price range. It is quite durable and robustly built, resembling many high-end scopes in its function and construction. Bushnell makes good scopes but this time they managed a great one! The ACSS line by Primary Arms encompasses a lot of scopes of different power levels and setups. For this we chose a scout scope that is rugged and dependable. It’s optically sound with good lenses and a good multi-coat. It has an illuminated circle reticle mil bar making it fast at close range and capable at medium range. On the budget end of the Vortex Lineup, the Crossfire II is a great scope for an amazing price. This is easily among the best scopes you can get in this price range and better than many more expensive options. It features a dead hold reticle that offers a blend between a duplex and BDC reticle. The optics are great and it’s tough as nails. What more could you want for a budget price? The VX series is probably the best selling for Leupold. It has everything you love about a Leupold scope from the great lens quality to impeccable construction and a solid warranty. For the price it’s hard to beat if you are an avid hunter. It was designed for you by people who know scopes! The Prostaff is easily the most popular Nikon scope with thousands of these mounted on rifles, shotguns, and muzzleloaders around the world. It is a solidly built scope with great light transfer and lens quality. This one features a bullet drop reticle to assist with aiming. It may be low on power compared to some but when you need to hit your mark at medium range, this scope is more than capable. The Banner series by Bushnell has been one of the top-selling hunting scopes for the last couple of years. The quality is all there. It has great optics and is waterproof and rugged for hunting. What is missing is the high price tag. It’s a simple variable power scope with a duplex reticle that is a great choice for those people who hunt when light levels are low. Burris’ answer to the hunting scope market is the Fullfield. It is quite powerful at 14x on the high end and has fairly good optics. They may not come close to what you get on high dollar scopes but the glass quality is good for any budget scope. Quick and simple to use with Burris’ modified duplex reticle, this is a good scope for those people who hunt at a little longer range. This powerful 16x max scope is a full-featured tactical scope at a price far below what you would ever expect to pay. This would normally mean low quality but the PA scope is actually quite good. The optics are clear and the scope is beyond tough. It features a mil-dot reticle and mil adjustments on the turrets. If you are just getting started with long range shooting, this is a great beginner option. Simmons specializes in budget scopes and while they are run of the mill optically, they are quite durable and functional. For the hunter who is a little tight this season, this is a serviceable scope at a very low cost. You won’t get the best but you can very well get a scope that will greatly improve your chances of making a good shot. UTG is an offshore company that specializes in optics that are fully featured. They may lack a little in optical quality and durability but they have every feature you could want on a scope. Illuminated mil-dot reticle, Turret adjustments, and side focus. You would never find this combination on a scope this affordable anywhere else. This is what I would consider the most affordable quality optic out there. The glass is decent, better than anything else in this price range. The scope is the same rugged design used on Bushnell’s other optics. There are few features, just a plain 2-7x scope with a duplex reticle. It’s quite accurate and makes a decent hunting scope for most any platform. Some calibers, rifle types, and even specific rifles warrant special consideration when choosing an optic. There may not be a single option that is better than all others but for the majority of shooters, there are optics that are a better fit for your firearm. It would be too lengthy to go into each specific one but below are some of the more common options. The AR 15 is generally built as a close to medium range rifle though it is capable of reaching longer distances. It is such a versatile platform that picking a single optic can be difficult. If you had to choose only one, a scout style scope is probably your best bet. Something that maxes out its power at less than 10x and has no more than a 4x minimum power would be good. You could go with a variety of reticle types but something that emphasizes speed would play to the AR 15 best. The same would be true of a Scar 17 optic in the same caliber as the weapons are closely related. An off the shelf Ruger 10/22 isn’t the most accurate .22 rifle around but is accurate enough to warrant a good scope. It is a versatile rifle but it excels more at shooting quickly than it does at precision. You want to play strongly to that speed when selecting an optic. Much like the AR 15, you don’t want a lot of magnification. Max of around 10x is fine in most cases. Much more than that and the rifle won’t be able to keep up. Stick with something simple without advanced adjustments or reticles. The M1A is a rather accurate .308 rifle that has exceptional range. In most cases it will not keep up with a bolt action rifle but you could get enough accuracy out of one to get a long range scope. For most people you won’t need anything too complex. Max accuracy is probably best in the mid to high teens. This gives you good enough distance accuracy to make use of the M1A but with a variable power scope, you can get a low end that allows for quick shooting at closer ranges. This is your best bet. The AK isn’t well known for accuracy which may or may not be false. Still, it works better with lower magnification scopes. The AK is a great short distance weapon but weakens as it gets past 300 yards so you don’t need to push it too far. The best scope for an AK is probably something like a 1-4x or a 2-7x. These have low power options for close range shooting yet enough power to get out to 200 or even 300 yards if you are good enough. For an AK, a scope that is very durable and robust seems fitting. When you look at the .308 rifle, it is known for long range accuracy and can make use of a powerful optic. With a max effective range of 800 yards, this is a place where high magnification can be a lot of fun. It can handle most any scope you care to put on it. Most of the time, a scope around 15x max is more than enough but some people truly enjoy something in the 20x range for a .308. Get a scope with a good BDC reticle and turret style adjustments. If you have a good rifle, it's hard to get too much scope. This is a common one these days with the growing popularity of this very versatile round. It may be best to equate this to something like the AK 47. It isn’t great when it gets out past 300 yards or so but it is very good at closer ranges. Something in the 1-4x or 2-7x is a perfect fit here. It preserves the up close strengths of the .300 while giving you enough magnification to extend the reach as much as you need. There is no need for complexity but something with a reticle that aids quick aiming is a good choice. When we talk about rimfires we mean bolt action or otherwise very accurate .22 or .17 caliber rifles. You can go two distinct ways with either of these calibers and play to their strengths but its probably the most fun to get a really powerful scope and see what it can do. Version one would be a scope that maxes out around 10x and plays to the short and mid-range accuracy for varmints and small game. Version two would be something in the high 20x range or even more to shoot tiny targets for benchrest or sandbag shoots. It really depends on what you want out of your rifle. A scout rifle is typically a rifle made for shorter ranges but is accurate enough for some distance shots. Adding a scout scope extends the maximum accurate range without compromising the ability to quickly engage at shorter distances. The best scout scopes are 1-4x though you can go with a little higher power if you want. As a rule of thumb, you want your low-end magnification to be no more than 2x and you probably shouldn’t go for anything over 8x on the high end. Yes, shotguns can be very effective with a scope though it isn’t the first thing you think of when a shotgun comes to mind. This is more for slugs though even buckshot can benefit from a low magnification optic. The key with a shotgun scope is eye relief. Not only does it have a lot of recoil but often the mounting position on a shotgun is farther forward than on a rifle. You won’t need much magnification as you will never be shooting more than 100 yards. 6x is a good max number to aim for and hopefully with a reticle that is made for better speed. If you shoot 3 gun, having a fast scope on your rifle can improve your score. The trick is to improve your accuracy without hurting your speed. This is tricky but can be done with the right optic. Low magnification is key. Even an optic with 1x and a proper reticle can assist you just enough to put you over the edge. Don’t go with high magnifications, it will only harm you in the end. Max of 4x is probably all you will ever need if you need even that. Schmidt & Bender are near legendary scopes. Most people have never seen one, much less considered owning one. Their prices are high but so is there precision and quality. If there was an all-around gold standard for optics, it would easily go to them. Having specialized in military and law enforcement scopes, their optics are typically moderately powered but have all of the features and are tough as nails. They can be very hard to come by but if you can swing the price and find one for sale, you will never own a better optic. Swarovski may be best known for their crystal but they really started as an optics company. Needless to say, they know a thing or two about perfect glass from all the delicate figures they make. They are simply the best glass you are ever going to look through. Early in their optics operation, it was more centered around sport optics and not rifle optics. When they did move into the hunting and shooting sports, they were more made for the gentleman hunter and not hard use. Recently they have started producing some military grade hardware and it simply stunning! Carl Zeiss was a man who understood both hunting and optics and did a phenomenal job right from the start. This has lead Zeiss to be a premier company for many years. They produce some of the best scopes you can own but usually aren’t know for their over the top durability. Zeiss does have some military and LEO scopes but more of their optics are centered around sport shooting and the softer sorts of hunting. They are pricy but if you can swing one, you are guaranteed quality. In the modern shooting world, Nightforce has become the standard by which all other scopes are judged. They are optically astounding and as durable as you can possibly make a scope. Their reputation is near legendary and every bit of it is deserved. The outstanding feature of Nightforce as a company is their quality control. They produce a variety of scopes from 40x benchrest models to 10x military grade scopes. All of them are tested to make sure they are perfect before they ever get boxed to sell. Probably the most well-known scope manufacturer in the U.S., Leupold has been making some of the best hunting scopes for generations. They do make a number of long-range scopes and even some that are military grade. While most of Leupold’s scopes are simply amazing, they do offer some budget scopes that are a little less stellar. While this may have hurt them overall as a company, no one who ever shoots a high-end Leupold will ever doubt their quality. Vortex is the fan favorite scope company right now and with very good reason. They started their company with the idea of producing great quality optics but selling them for far less than their competitors. This has paid off massively! There are really three tiers of Vortex scopes. The quality between the tiers is fairly close but the price can be quite a lot. A low tier Vortex is far superior to any other scope in its price range while a high-end scope will compete with the best out there and usually save you a decent bit of money. Burris is a midrange scope company that has produced optics for the budget minded hunter for decades. They produce a good scope and sell it for quite a good price. If they have a shortcoming, it is in durability but that is common among scopes at their price point. Recently, Burris has been experimenting with higher end optics and done quite well with them. Their Veracity scope is a perfect example of the quality they can achieve when they want to dedicate the time and resources to it. Nikon is an optics staple that has been a mainstay in the market for a generation. Their Monarch and Buckmaster series of scopes have been immensely popular with hunters across the country for years. Their strength is in their exceptional quality glass without the cost of some other brands. While Nikon has always made the most from their midrange scopes, their high-end options have always been lurking there. Some police forces used Nikon optics back in the 90s and their new Nikon Black is an exceptional scope that shows what they can do. If there is one company that has outfitted more hunters than any other: from rifle scopes, rangefinder, binoculars or trail cameras, it has to be Bushnell. There are thousands of their optics on hunting rifles used every season. This is because their optics are simply a good bang for your buck. They do produce some excellent higher end scopes but they have never been extremely popular. Though the quality is definitely there, the market at the price point of their higher end optics is just to flooded. Though they are best known for their pistols and AR 15s, Sig is making a strong showing in the optics world. They produce binoculars and rangefinders in addition to their rifle scopes and all of them have received a lot of praise from shooters. Though they mostly cater to the tactical market, some of their scopes are geared to hunters. They are all in the middle range of price and quality but are quite good and at a good price to compete with the many brands bucking for sales in their price range. Primary Arms was all the rage before Vortex hit the market. Simply put, they had trouble competing with the cost of a Vortex for quite some time. Now, the price of the two has somewhat balanced out and PA is gaining some ground. Where Vortex offers a massive range of optics, PA has stuck with just a few and done them well. They offer some features that are almost unheard of at their price point and still manage to be a great quality scope. They have had some quality control issues but it seems to be rare and they have always taken care of the problem. Redfield is one of many optics brands that started as their own company before being acquired by a larger brand. Though they were in business on their own for quite some time, they were recently bought by Leupold. While much of the construction of Redfield is the same as it has always been, some parts of their scopes have improved. 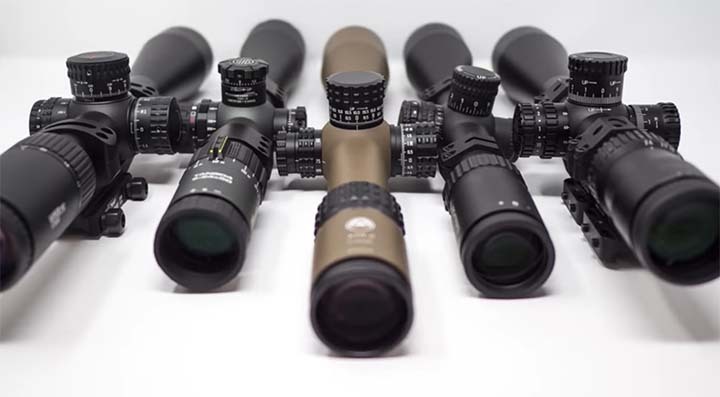 In the modern market, Leupold uses them as their budget series but has changed the lens quality to a better glass and updated the warranty and QC process. This has been good for Redfield overall. It is worth noting that Redfield makes only one scope in different power options. Athlon started out as a telescope manufacturer which means they know the ins and outs of seeing things at a distance. Recently they have made the move into sport optics, mostly with rifle scopes, and done a very good job overall. While their optics are not known to be the most durable, they have simply phenomenal glass. At their price point, they have probably the best lenses of any company out there. Overall, their scopes are well loved by those wanting a budget option that is capable of great optical clarity. About a decade ago SWFA released a scope called the Super Sniper that has been renamed the SS. This was a highly sought after optic to the point they had supply problems. While it was not an exceptional scope on its own, it was far better than the price would lead you to believe. Since then, they have fallen into obscurity with companies like Primary Arms and Vortex stealing their thunder. That said, the SWFA SS is still a great scope for the money and has a ton of features for an amazing price. All SWFA Scopes are essentially clones. The power and objective size changes but the rest stays consistent. Simmons has always occupied a niche in the budget scope line and been happy to stay there. Their price point is consistently under $100.00. This does mean there is a drastic difference in quality between these and some of the mid-range manufacturers but if you accept that, Simmons can make a usable scope. Simmons scopes are simple to keep the price low. Their glass is of decent quality, especially for the price. They are even relatively robust. They will sometimes have an issue with losing zero and should be checked from time to time. Otherwise, if you are tight on money, this is a scope that can do the job. There are a number of companies selling cheaper scopes that rely on Amazon for their supply chain and point of sale. While this is generally frowned upon, it is a great way to sell your product for cheaper. This is exactly what UTG does. Their small line of scopes is actually decent considering their very low cost. Many of their scopes have some pretty advanced features and are quite fun to play with. While they are not a great choice for the hunter or tactical market, they make a great first scope or even a good scope for a plinking rifle. As we move to the non-traditional scope manufactures, we are going to start with Trijicon. Very few companies have the long-running reputation that they have and few have ever reached the level of quality that Trijicon can claim. Though they are best known for red dot sights and holographic sights systems they started with a magnified optic and are now producing a few different models of rifle scopes. They are costly but the quality is top notch. Most have some form of innovative feature that seems to push them over the top. Sightmark is another red dot producer but one that has branched out. Early on their red dots were quite popular but they were quickly beaten by Aimpoint and several other mil-spec brands. Since they have begun producing some standard optics that are quite reasonable. On the lower end of the spectrum, they have consistently sold their scopes. They may not be as popular as other brands like Nikon and Burris but they hold their own. They even make one of the most affordable and best low-end night vision scopes that actually relies on true night vision technology. We have saved ATN for last, not because they are the least but because they are so different. ATN made the news a few years back with the first smart rifle scope. By using a built-in rangefinder and other sensors, it could use your own ballistic data to automatically adjust for your shot. Since this novel achievement they have moved on to make smart night vision and even thermal scopes. While they are a niche market, they are worth checking out. So far, no one is doing what they are doing. There is no competition in their market. While a good rifle scope is a huge asset, there are times when they are not the best option or can be augmented by a different optic altogether. We want to examine some of the other scope options and see what they have to offer and how to employ them with a standard rifle scope. While some standard scopes are capable of performing in the dimmer conditions of dusk and dawn, they can never work as dark approaches. For that the classic choice is a night vision scope but not all night vision scopes are created equal. There are two types of night vision, the true night vision that is used by the military and digital night vision that is much like what is used in home security systems. Though they achieve the same goal and both are good technology, they work in completely different ways. True night vision actually magnifies ambient light. This gives it the strength of being able to see much farther in the dark than digital night vision. However, it is very expensive and will only work in dark conditions that have some ambient light. Digital Night Vision works by using Infra-red light which is invisible to the naked eye. It is much more affordable than true night vision but has a limited range. It can see in any conditions if you add an IR illuminator but without it, it is blind. Most digital night vision can be used during the day which makes it much more versatile. No matter which technology you choose, having the ability to see clearly after dark is a game changer in the hunting and home defense scenario. With prices coming down, the addition of one of these technologies to your arsenal is a worthwhile investment. This is not a digital night vision but the real deal. It may be based on 1st generation technology but it has more than 1st gen performance. Magnification is a lower 5x but with a near unlimited view distance, it will outperform many digital scopes. It comes with a removable IR illuminator which will allow you to see in total darkness undetected. The whole unit is shockproof and has an illuminated reticle for quicker targeting. Mounts by standard weaver rails to any weapon. This is a solid, affordable night vision scope. No frills, just the real technology. Much like night vision, thermal optics give you the ability to see in full dark. Not by amplifying light but by detecting heat. This is simply one of the coolest technologies to come about in recent years and one that has serious uses for hunting, home defense, and many other applications. The sensors that enable thermal optics to work are quite complicated and a detailed explanation is beyond the scope of this article. A basic view of how it works would be more appropriate. All warm objects give off thermal radiation depending on their temperature. A thermal scope picks up this radiation and converts it to some form of visible image. The type of image varies and many thermal optics can use a variety of modes from the classic rainbow pattern of the movie Predator to a white or black image that contrasts with the background. All of these are effective for showing living things in total darkness. There is no need for any light source to use a thermal scope and many of them will work the same night or day. While they are far more versatile at night time, they can be used in dense woodlands to actually see through the leaves and brush. This technology is expensive. There are no cheap thermal optics. The price is coming down but slowly. There simply aren’t enough competitors in the marketplace to drive prices any lower. If you can afford one, these are amazing scopes that are well worth the cost. This is a thermal scope with all of the trimmings which is just what you would expect from ATN. The features include Wi-Fi, streaming video, smart rangefinder, ballistic calculator, and apps to control everything remotely. That’s the extras. The scope its self uses a highly sensitive scanner that can detect heat over a mile away. The scope magnification range is 5 to 50x so you can shoot about as far as you ever wanted to. Realistically, you are going to max out about 600 meters to identify a target but you have everything you need to hit that far away. While this is in a completely different vein, it's worth talking about a good spotting scope. They are not weapon mounted but they serve a purpose alongside a weapon mounted scope. Enough of a purpose that most military and police snipers employ them as well as most long range shooters and hunters. The spotting scope has more power and a larger field of view than a rifle scope. This allows them to see more and to see it at finer detail. It is a great tool for locating targets and for seeing bullet impacts. Many shooters will use a spotting scope when sighting in their rifle to make it easier to read the targets. This saves time and makes the whole process easier. All you have to do is look through the scope rather than clear your rifle and walk down range. The most common method of use for a spotting scope is to scan a large area for what you are hunting and then go to the scope. This is far more efficient than scanning with the naked eye or through your rifle scope. You can see far better over a larger range making scanning more effective and simpler. You can also use a spotting scope as a learning aid as you just start out with long distance shooting. By having a second person call out your shot locations, you can learn how distance, wind, temperature and all of the other variables affect your shot. This is a vital piece of knowledge if you want to be successful at long range. There are hundreds of good spotting scopes on the market but dollar for dollar, I have to give it to Vortex. The Razor is a stunning scope with amazing lenses and absolutely perfect color and contrast. It’s like extending your natural vision only better. You won’t even realize you are looking through an optic it’s so good. There are a number of magnifications to choose from ranging from 11-33x to an astonishing 27-60x. It has the power, it has the quality, and it also packs in durability. Completely sealed and nitrogen purged, it is waterproof, shockproof, dustproof, and fog proof. Add any more and it would be damage proof. If you want to spend your money wisely, spend it on this. There is a lot to consider when getting a scope and a lot of pitfalls that can lead you to getting something less than ideal. Much of the advice above digs into this briefly but to lay it out formally, here are the most common mistakes when purchasing a scope. There is a grain of truth there. Not all scopes are created equal and while you can get a good scope for a few hundred dollars, the more you are willing and able to spend the more likely you are to get a product that really performs up to your expectations. If you just want a plinking scope, you can go a little lower priced. Not all hunting scopes have to cost a fortune. There are many that will do perfectly for little cost. However, if you are really wanting to get that long shot, you better be willing to spend the money. Far too many people shop only based on magnification and end up getting a scope that is either too powerful for their needs. Sometimes a scope with high magnification costs you on other aspects of the scope. Though there are some decent high powered scopes, most scopes that are cheap and powerful are not worth the money. Spend your money wisely. If you are only planning to shoot a couple hundred yards, you don’t need a 20x scope unless you really plan on hitting tiny targets. Know the maximum range of the rifle you are using and base your scope purchase around that and what you intend to shoot with it. A 20x scope in the eastern woodlands for deer is a waste. While there is likely a perfect scope for your rifle and your needs, there is no single, universal perfect scope. Every optic has a trade-off. Powerful scopes can hit small targets but are slower. Circle reticles are fast but make pin-point accuracy impossible. Know what you want a scope to do and get a scope specific to that purpose. Don’t try to answer every problem with a single optic. As you may have read above, some scopes come equipped with turret adjustments and ballistic reticles to dial in on targets and help you make those long shots. They work great for that purpose but they are difficult to master. The deer hunter likely doesn’t need all the extras and they will only complicate matters. Know what reticle works best for you. If you aren’t going to be dialing in elevation and windage on each shot, there is not need for turrets. Only get a scope that is as complicated as you need it to be. If you are only shooting 300 yards, you don’t need the extras. Stick with what you know how to use and learn as you progress. Every optic on this list has some form of warranty. Some will guarantee for life against anything faulty craftsmanship like Primary Arms. Some like Vortex guarantee against anything. A scope is a huge investment. Keep your warranty information handy and know what is covered and what is not. Don’t miss out because you lost or didn’t take the time to read up. While you are at it, register your product if that is an option. It will make things much easier if you need service later on. Companies like Leupold will often service their scopes for free but you need to get registered to do so. Just as important as selecting the correct scope for you is getting it set up right in the first place. Your scope has to be properly mounted, sighted in correctly, and properly maintained in order to get the best performance possible out of it. The following guide will get you through the whole process. You will need three things other than your scope and rifle to mount your scope. A good set of appropriately sized rings, bases to attach to your rifle, and a tool to attach them. Scope rings are the main interface between your scope and your rifle. They need to hold the scope firmly without putting too much pressure on it. They have to fit to the gun via bases or a rail in a way that the scope will not move. They have to be sturdy and not give with repeated shots. Not all rings are the same. If you are building a precision rifle with a high-end scope, get lapped rings. They cost much more but they are the only way to get the most out of your build. For a hunter or those shooting for fun, most rings will work just fine. Rings are sized to fit a specific scope. This can be either a 1-inch ring or a 30mm ring. Make sure you get the appropriate size. Rings may also be purchased as two separate rings or as one set of rings with a single base. If your rifle has a rail system, either will work just fine. If you have to add bases to your rifle, separate rings are often the better choice. Scope bases are small rails that attach to your rifle receiver. With a rail system like on a AR 15, you won’t need bases. The main point to always check is to make sure your scope rings will fit your bases. This could be Picatinny or Weaver style but most are interchangeable. The final thing you will need is the tool to mount them. Often, they attach with a hex head screw so you could use a hex wrench. However, this should be avoided. Instead get a torque wrench like the Wheeler Fat Wrench for the job. These ensure proper tightness without damaging your scope. With everything ready, align your bases and attach them to the torque specified by your gun manufacturer. Some people use a small bit of blue Loctite to make sure they stay tight. If you do this, only use a small amount and make sure it doesn’t get into the action of your rifle. Next attach the lower ring half to the bases. Tighten until they are firm. No need to check torque or apply Loctite. With that done, place your scope centered in the ring and place the top half on. Use a small amount of Loctite on each screw and tighten until they hold the scope but you are still able to move it easily. At this point make sure that the scope crosshairs are aligned until the windage line is perfectly flat to the top of the rifle. This can take some time but your accuracy depends on it. A small level laid across the top knob of the scope can help. Once you are happy with that alignment, tighten everything down with the torque wrench to the poundage specified by your scope manufacture. This can be found in your manual or on the manufacturer website. Probably the most intimidating aspect of getting a new scope is getting zeroed if you are new to the process. However, it really isn’t that difficult or mysterious. With a little time, you can get a solid zero. The first step is to bore sight your scope. You can get a laser bore sight for relatively cheap from a number of suppliers or head to your local gun store or hunting outfitter. Most of them will be glad to bore sight your rifle. It takes just a couple of minutes but will save you a lot of headache. For the remainder of the process, I will discuss the way I zero a rifle. There are other methods but I have used this stepping in method on dozens of rifles. This part of the article assumes that you are sighting in at the standard 100 yards. The next step is to head to the range. You will want something to steady your rifle. A gun vice is the best choice but a sandbag will work if you don’t have one. Without this zeroing will always be a challenge. A start my zero at 10 yards to make sure I am hitting paper. I am not worried about hitting the bullseye at this point, just making sure that the bullet impacts the target and doesn’t shoot around it. I shoot a couple of shots here. I then move the target out to 50 yards and repeat the process. At this point I do want impacts within a few inches of the bullseye. I shoot 2 to 3 shots. If they are all on paper, I move the target on out to 100 yards. This is where the fine-tuning begins. Fire a group of three rounds while holding your crosshair directly on the center of the bullseye. You can use a target that has gridlines to line up to your scope if you choose. They do make it easier. Once I have a group, I will start adjusting. I always start with elevation first. Take your time and make each shot the best you can. Hold at the center of the target and fire 2 more shots. Repeat this process until you are vertically aligned with the center of the target. After your elevation is correct, move on to windage and repeat the process. I like to wait until there is very little wind to make my shots. After three shots, I move and fire 2 more until I am centered on the bullseye. Once I have a zero, I like to shoot a series of 3 round groups on a fresh target. I will fire 3 to 5 groups and see how they fall before I call the process done. From here I can fine tune the zero or keep it as is. With this done, I make notes on where my scope settings are before capping them. If your scope has a zero reset, you can loosen the screws and reset to zero now. Vortex Optics - How To Sight In Your Riflescope? With modern rifle scopes, maintenance is minimal. You need to keep it clean and dry but otherwise, your scope should be left alone. Never attempt to dismantle your scope. If you do, it will be ruined. Special machines are used to assemble scopes and you cannot replicate them at home. For cleaning I use microfiber towels and a cleaning solution. You can purchase the cleaning solution or make your own with equal parts water and white vinegar. Never apply the solution directly to the scope lens. Instead moisten the microfiber cloth and gently wipe the lenses clean. Dry them and leave them be. Make sure your cleaning cloth is free of particles that could scratch your scope or chemicals that could cause smudging. Cover cleaned lenses with a set of lens caps before storage. This will prevent dust or other contaminants from settling on the lenses. The body of the scope can be cleaned in the rare case it is needed by using very fine steel wool and gentle pressure. Don’t do this near the lenses or any dial on your scope. If corrosion is bad, consult your manufacturer to see what they recommend. When cleaning your gun, avoid getting oil on your scope. Some oils can penetrate your scope body and cause issues with the lenses on the inside. However, never remove your scope from your gun while cleaning. This will change your zero and you will have to sight in again. Once your scope is clean, store it in a dry safe with some form of moisture control. Your scoped rifle should be placed in the safe so that the scope does not press against the side of the safe or any other firearm. Always store your scope with lens caps securely attached. You can add a scope cover if you like. These will help hold the lens caps on while protecting the scope body. While many scopes are tough, the constant pressure of being pressed against another gun will cause them to shift. Here's great resource for optics maintenance from Zeiss. There is more knowledge here than you are likely to need in selecting what is the best rifle scope for you but if you use all of this combined you are far more likely to get the scope that will serve you best. Shooting a firearm with a great scope that has been properly sighted in is a pleasure and opens new challenges in the shooting world. It is an addiction and a skill that requires constant improvement to stay at the top of the game.